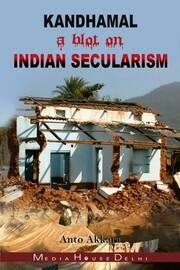 2 editions of Kandhamal, a blot on Indian Secularism found in the catalog. Add another edition? Are you sure you want to remove Kandhamal, a blot on Indian Secularism from your list? Published April 2009 by Media House in Delhi . When the national media forgot the simmering anti-Christian violence in Kandhamal, journalist Anto Akkara stirred the national conscience with his investigative book 'Kandhamal - a blot on Indian Secularism' after repeated arduous trips to the remote jungle district. Since veteran journalist Kuldip Nayar described the book as ‘one of the must-read books’ at its launch in New Delhi in April 2009, it has been hailed by cross sections. During the Bangalore launch, Justice M F Saldana said that given the objectivity of the book, it should be treated as an ‘official report’ of the Kandhamal violence and the government should act on it. K G Kannabiran, president of People’s Union for Civil Liberties, hailed the book as ‘a charge-sheet on Kandhamal’ during the launch in Hyderabad. Renowned litterateur Sukumar Azhikode recommended the book to be made a ‘text book’ at its release at the Kerala Sahitya Academy. Given the impact the investigative book made, the author had a personal audience with P Chidambaram, then Home Minister of India. Chidambaram not only visited Kandhamal soon after receiving the book and he even told Indian Parliament that what happened in Kandhamal was ‘a blot on the face of Orissa’ – quoting the title of the book. September 10, 2009 Created by ImportBot Initial record created, from Library of Congress MARC record.